We've shown you impressive anamorphic illusions in the past, but the work of Felice Varini brings the medium to an unprecedented level of grandeur. 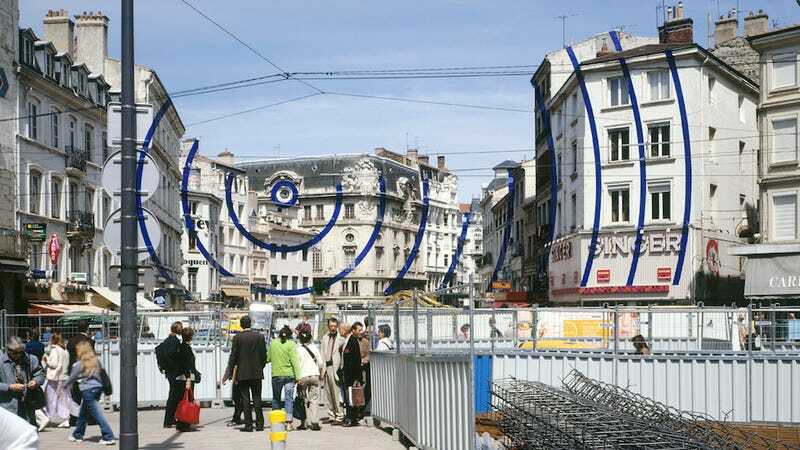 For decades now, the Swiss artist has been creating some of the most remarkable perspective-dependent illusions on Earth, painting rooms, buildings, and sometimes entire city squares with ribbons of color that make little-to-no sense – until the viewer finds herself in precisely the right location. If you draw a circle on a flat canvas it will always look the same. The drawn circle will retain the flatness of the canvas. This kind of working is very limiting to me, so I project a circle onto spaces, onto walls or mountain sides, and then the circle’s shape is altered naturally because the ‘canvas’ is not flat. A mountain side has curves that affect the circle, and change the circle’s geometry. So, I do not need to portray complicated forms in my paintings. I can just use the simplicity of forms, because the reality out there distorts forms in any case, and creates variations on its own accord. We've included a few of our favorite examples below, but check out Varini's page for the full experience. 2013 - "Onze disques pour onze carrés"
2012 - "Double trapèze pour quatre triangles"
2005 - "Entre ciel et terre"
1999 - "Encerclement à dix"
Many, many, many more examples of Varini's work on his website.